Mohamed Salah broke yet another record on Saturday, when he scored his 30th league goal to help Liverpool to a comfortable 3-0 victory over Bournemouth. He is just the eighth player to reach that landmark in a Premier League season and the first African to do so - eclipsing then Chelsea striker Didier Drogba's record of 29 in 2009-10. More significantly, his tally in all competitions this season is now 40 - a figure only two other players in Liverpool's history have achieved. Roger Hunt (1961-62) was the first - and Ian Rush (1983-84 and 1986-87) the second. The 25-year-old's goals and assists have earned Liverpool an extra 15 points this term - more than any other Premier League player - and he is closing in on Rush's record of 47 goals from 1983-84. It took Rush 65 games to reach that mark, but Salah has reached 40 it in 20 matches fewer - with eight goals in his past five appearances. 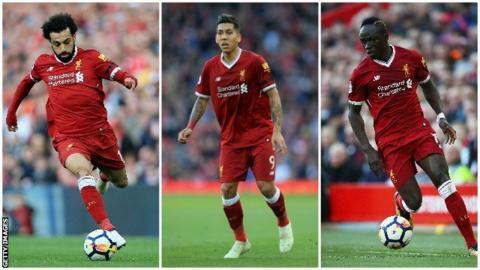 Liverpool's attacking trio - Salah, Roberto Firmino and Sadio Mane - have combined to score a total of 82 goals this season. That has helped the club score 121 goals in all competitions - a figure manager Jurgen Klopp described as "crazy". "What a number. Wow! That's really good but we have to carry on," said the German. Since Klopp's arrival in October 2015, Liverpool have scored 300 goals in 148 games. That goalscoring prowess has helped Liverpool achieve a win percentage second only to Rafa Benitez's reign in the past 15 years. And Salah is not the only one breaking individual records. Mane is now the highest-scoring Senegalese player in Premier League history - his 44 goals eclipsing Demba Ba's total of 43. Of players to have hit 10 or more goals in all of their Premier League seasons, only Sergio Aguero (seven seasons) and Eric Cantona (five) have done it more often than Mane (four). Firmino, meanwhile, has surpassed his best tally in the league and makes it three successive seasons in which he has reached double figures. And Reds midfielder Alex Oxlade-Chamberlain has equalled his best Premier League goal involvement tally in one season (three goals, six assists). "Someone like Giroud knows how to come off the bench and make an impact." Match of the Day pundit Ian Wright hit the nail on the head after Olivier Giroud was introduced in the 61st minute with Chelsea trailing Southampton 2-0 on Saturday. It took the Frenchman just nine minutes to make an impact with his first league goal for the Blues. He scored his second eight minutes later to complete the comeback as Chelsea won 3-2 and moved within seven points of fourth-placed Tottenham. The goals meant Giroud increased his tally as a substitute to 19 in the Premier League - a total only bettered by Jermain Defoe. The Bournemouth striker is also the only current Premier League player to have scored more goals in the 85th minute or later than Giroud. Is Giroud more effective from the bench? Former Arsenal striker Giroud is the top-scoring substitute in the Premier League this season with six. A quarter of his overall tally in the competition have come as a substitute. He also has a better minute-per-goals ratio than when he starts games, scoring every 67 minutes as a substitute compared to 183 minutes from the start. That may explain why more than half of his appearances in the Premier League have come from the bench (67 out of 121). Burnley's 2-1 victory over Leicester on Saturday boosted their hopes of qualifying for Europe for the first time in 51 years. The Clarets are on a roll - winning five consecutive matches in the top flight for the first time since November 1968 to take their tally to 14 for the season. In fact, their best form has been during the run-in, with maximum points in March and April. It has helped mask a poor run in January and February, during which they only picked up three points. Burnley have five games left to secure their place in next season's Europa League. Should they win them all, they would end with a higher points tally than the past five seventh-placed finishers in the Premier League. But there is a slight complication to their European quest. Seventh place will only be enough for a Europa League place if the FA Cup winners finish in the top six. That is likely - as Manchester United, Tottenham and Chelsea are in the semi-finals - but Southampton could yet cause an upset. One thing is certain, though - Sean Dyche's side have improved hugely since last season. The only month in which they picked up fewer points this time was January, but they have consistently been better throughout the rest of the campaign. Arsenal's 2-1 defeat at Newcastle on Sunday completed their worst run away from home in the top division since December 1984. It was their fifth successive away defeat in the league and their 11th overall in the division this season. That equalled their worst tally of league defeats in a season under Arsene Wenger. The cracks have shown in defence - they have conceded 45 goals this season - one more than in the whole of last season, with five games left to play. The Gunners, who are sixth, are 13 points adrift of the top four, meaning they are almost certain to miss out on a place in the Champions League for a second successive season - unless they win the Europa League. Wenger's side are 33 points behind champions Manchester City on 54 - their lowest tally at this stage of the season since 1995. Manchester City were crowned champions on Sunday following Manchester United's defeat by West Bromwich Albion at Old Trafford. They finished the job with five games left to play - a joint-record for securing the English top-flight title with the most games remaining. But there's still plenty to play for. City are now chasing the record points tally of 95, which was set by Chelsea in 2004-05. They are already level with Arsenal's 2001-02 title-winning side, who finished on 87 points. The Blues could also beat their own tally of 89, set in 2011-12. With 15 points still up for grabs, City could finish the season on 102 points. No team has won the English top flight with 100 points or more. Pep Guardiola could also beat his previous best points tally in a single league season as a manager - 99, with Barcelona in 2009-10.